Detailed by the local NBC affiliate in San Francisco, a group of vandals within the coastal California city traveled around the streets during Sunday night and early Monday morning flipping small smart cars over on the side, headlights or trunk of the vehicle. Hitting four smart cars in a few hours, an eyewitness account indicated that eight people wearing hooded sweatshirts flipped one of the cars. At approximately 1,500 to 1,800 pounds per car, each vehicle had smashed windows as well as significant body damage from being flipped over. Speaking about one of the car-tipping incidents, eyewitness Brandon Michael said “I thought they looked like they were up to no good and then sure enough they walk up to this Smart Car right here, all huddle around it and just lift it up and set it on its hind legs, like a dog on its hind legs, — that’s pretty much it.” According to San Francisco Police Officer Gordon Shyy, the car-tipping vandals have yet to be identified and will likely face felony charges if caught. Police aren’t sure if the smart car tipping was designed to be a statement against the small automobiles or simply random acts of vandalism. Smart cars are particularly popular in San Francisco due to the green footprint of the vehicles when compared against regular automobiles. In addition, those cars are significantly easier to park within a city known for limited, tight parking options along the streets. 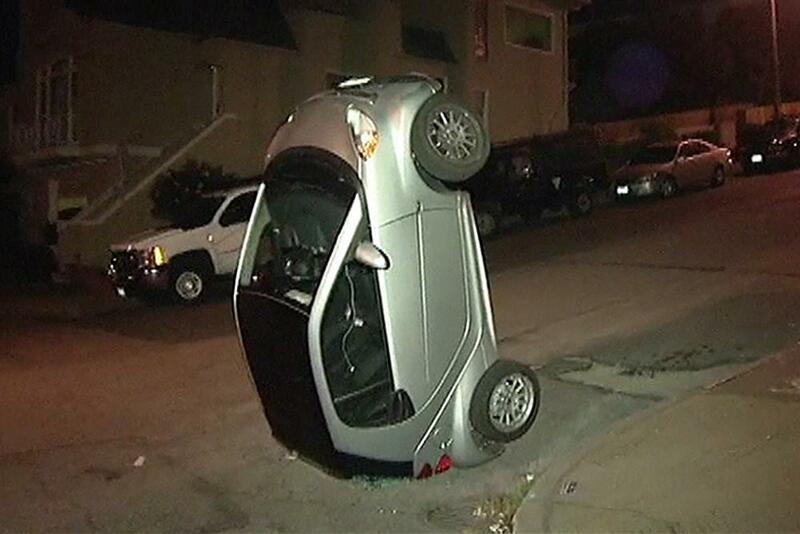 Of course, this isn’t the first time that people have been seen flipping over smart cars. During the riots on Vancouver during 2011, a group of people were recorded flipping over a smart car as the surrounding crowd both booed and cheered on. Two years prior to that, a 40-year-old man in Edmonton was arrested and charged with criminal mischief after allegedly tipping over a smart car.